As we continue to progress to older age groups in regard to American Development Model education and implementation, we should know that the Squirt and Peewee levels are the prime skill acquisition windows for our young players. Along with providing young players with plenty of hockey activity and skill development in our training sessions, we must also start to give them the ability to develop hockey awareness on their own. In other words, let them start to figure out how to develop good habits. One of the great early hockey lessons for our players is supporting the puck or simply, “getting open.” Too often we find our players staying in an area that is defended, or they’re not in a good spot to receive a pass. As coaches, we should always try to find ways for our young players to move to an area where they can get the puck if they don’t have it. And while we are giving the players many repetitions to improve their passing and receiving skills, we should also provide the opportunity for them to decide where to go in order to utilize these skills. A great way for young players to start acquiring this basic “get open” hockey knowledge is to work in outnumbered situations in small areas. One excellent drill is your basic 2-on-1 or Get Open Drill, which is played within a face-off circle or a square marked by cones or markings on the ice. The two offensive players are trying to pass and receive the puck while the defender is attempting to steal the puck. However, it is important that the players are moving to find the open area. An ideal way to get them to move is to force them to pass the puck within three seconds. 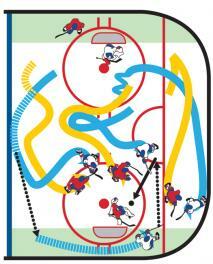 This will get both players trying to find the open ice. Another outstanding teaching tactic for getting open is the use of many small area games in training sessions. D-Man Breakout game and the “Gretzky” game. The D-Man Breakout Game is a 3-on-3 cross-ice game involving a breakout defenseman who can move anywhere behind the net but can’t move forward past the net. Players compete 3-on-3 but have to pass to their Breakout D-Man after each turnover for a regroup/breakout before they can attack the opposition’s goal. Coaches should stress that players need to get open after passing to the Breakout D-Man. You can add the three-second rule in this game where the puck is awarded to the opposing team if the Breakout D-Man is unable to complete a pass within three seconds. Players should rotate from playing 3-on-3 and being the Breakout D-Man. Once the pass is made to the Breakout D-Man the opposing players cannot contest that D-Man. 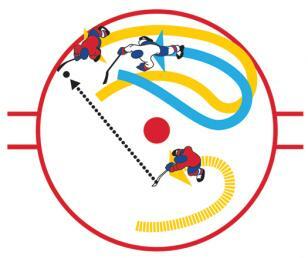 The “Gretzky” Game is the same format – 3-on-3 – with an additional player, or “Gretzky” behind the attacking goal. “Gretzky” can move anywhere behind the imaginary goal line but cannot cross over it. After players figure out both games, you can combine the games so that you must pass to your Breakout D-Man and then your “Gretzky” before attempting to score. These are great progression games that are suitable for all ages and are ideal for teaching young players hockey awareness and the ability to get open.